I made this recipe last week to take to a girlfriend house. One of my favourite recipes it’s so light and fresh. Great for summer days! 1. Place biscuits in a food processor and process until fine crumbs form. Add butter and pulse until combined. Using base of a glass, press biscuit mixture into base and side of six 8cm round loose-based tart pans. Alternatively, use one 22cm tart pan. Transfer to fridge. Chill for 30 minutes, until firm. 2. Using an electric mixer, beat cream cheese, sugar and Malibu or lemon juice until smooth. Spoon mixture into tart bases. Chill for 30 minutes. 3. To make mango coulis, place mango, sugar, lemon juice and 2 tablespoons water in a blender. Blend until smooth. Strain through a fine sieve. 4. 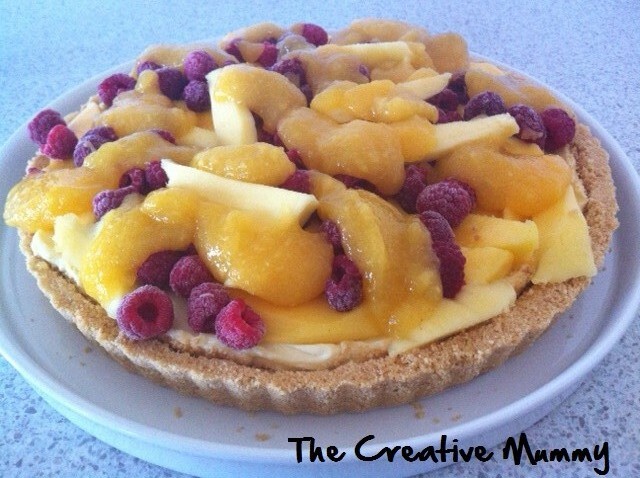 Place peaches and raspberries on tarts and drizzle with mango coulis. Serve.